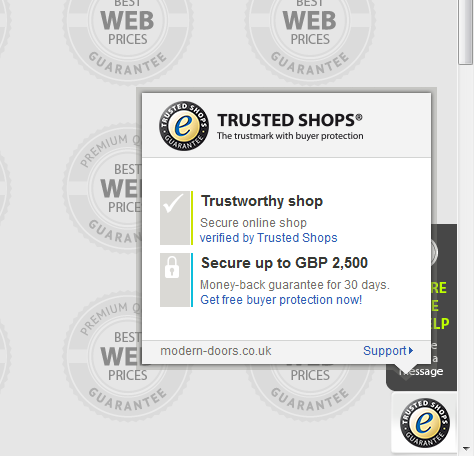 Modern Doors accredited by Trusted Shops scheme! What is a Trusted Shops scheme? Trusted Shops scheme is the leading European quality system for online shopping. Online shops accredited by this scheme are committed to meet high consumer protection requirements, including excellent trustworthiness, security mechanisms, customer service, price transparency and data protection. Members of Trusted Shops scheme are constantly reviewed and adapted to comply with the latest law and consumer protection requirements. How does a consumer benefit from the Trusted Shops scheme? 2. Trusted Shops Seller Rating provides independent and authentic reviews submitted by our previous clients, which helps to make an informed decision when choosing an online merchant to place your order. Our clients are only asked to submit their reviews after the order has been delivered, so once they have a complete picture of the quality of our service. 3. Free of charge Buyer Protection Guarantee applicable to all orders up to a value of GBP 2,500.00 (subject to registration after placing an order online). This protects your purchase price payment for 30 days in an event of goods not being delivered within the specified time frame or returning the goods back to us (subject to T&C’s). Additionally, after the 30 days period expires, you will be able to extend the guarantee for an additional 30 days up to a maximum of 120 days. At Modern Doors we are continuously working towards improving our service. We believe partnering with Trusted Shops offers first class advantages to our clients and it is another step forward towards making the online shopping for quality timber doors as seamless as possible. With that peace of mind, you can focus on finding the internal or external doors you are looking for.